Aleksander Yakushev was a giant among teammates, standing 6’3” and weighing 200 pounds. 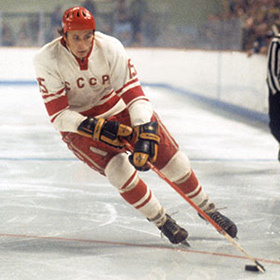 He used his size and skill to dominate opponents while starring for the Soviet Union during the 1970s. Most observers believe that had the political climate been different (Yakushev played during the Cold War), he could very easily have slid into a prominent role with a team in the National Hockey League. ‘Big Yak’ was born on January 2, 1947 in Balashikha, USSR, the son of parents who worked in a metallurgical plant in Moscow. Although he first excelled at football, Aleksander soon discovered a passion for hockey. Joining Moscow Spartak at the age of 16 in 1963-64, Yakushev played for the squad for 17 seasons. He was a prolific scorer for Spartak, recording 50 goals in the 42 games of the 1968-69 season. In 1976, Yakushev was made captain of the team. Through 568 league games, he scored 339 goals and just shy of 500 points. In 1980-81, Yakushev joined SV Kapfenberg in Austria and continued his torrid scoring, recording 108 goals, 145 assists and 253 points in 109 games before retiring as a player at the conclusion of the 1982-83 season. Aleksander Yakushev represented the Soviet Union an astounding 144 times through his lengthy career. Included are seven gold medals at World Championships as well as silver medals in 1972 and 1976 and a bronze medal in 1977. 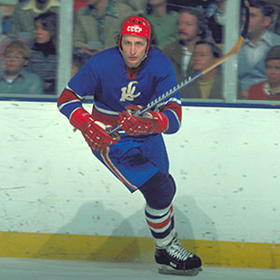 Yakushev was selected to the All-Star Team at the World Championships in 1974 and 1975, and in the latter tournament, he was also named the best forward. He also was a member of the Olympic gold medal-winning Soviet teams in 1972 and 1976. 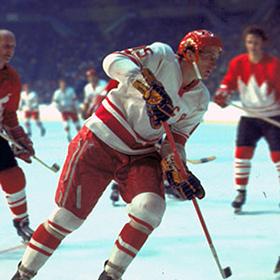 Yet, the reason many know the name Aleksander Yakushev is because of his exploits at the Summit Series pitting the best players from the Soviet Union against the best players from Canada playing in the NHL in 1972. The landmark series took place over eight games; four in Canada and four in the Soviet Union. Game One, played on September 2 in Montreal, saw Yakushev record a goal and an assist in a shocking 7-3 thrashing of Team Canada. 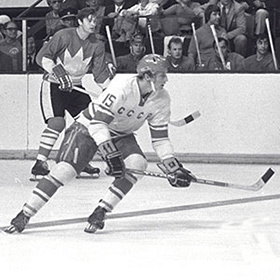 In the second game, played in Toronto on September 4, Canada won 4-1, with Yakushev scoring the lone Soviet goal. Winnipeg hosted Game Three on September 6, which was a 4-4 deadlock, and Yakushev didn’t figure into the scoring. The final game in Canada was played September 8 in Vancouver. Yakushev picked up an assist in a 5-3 Soviet win. 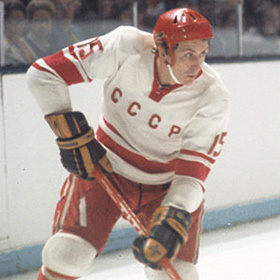 Aleksander Yakushev was inducted into the Russian Hockey Hall of Fame in 1970 and into the International Ice Hockey Federation (IIHF) Hall of Fame in 2003.